I should start by saying that I am an introvert--one who fought against being an introvert for many years as I was continually told that I needed to change, that I needed to "come out of my box." So, from my personal position, this was an incredibly freeing book to read. Cain starts by examining not introverts, but the extrovert ideal. When I first started, I found this a bit awkward. However, as I got into the book, I realized that this was necessary to set the foundation for her examination of introverts. And she does examine them from every angle--nature versus nurture, cultural influences, even biological influences. This book is packed with information, but Cain is able to present it in such a way that it is easily readable. There were times that I felt it dragged just a bit, but that happened when she discussed areas (such as business) for which I don't have much interest. Other people may find those sections to be the most interesting. I've seen many bloggers reading this book, and I know it has shown up on more than a few "bests" lists. And I'm happy for that. 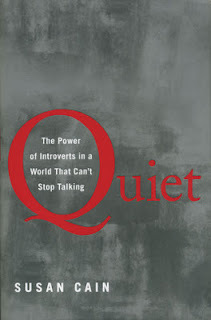 Cain has an important message to share and I hope that people do read this book--introverts and extroverts--and take it to heart. I'm still working on this book right now, and I think you said it best- it is freeing, as an introvert. I want to send a copy of this book to every person who has ever told me I need to come out of my shell. This has been on my TBR list since I first heard of it. I really, really need to carve out the time to read it. I'm an introvert in a family of introverts -- my husband and daughter are more introverted than I am.